(May 24, 2013 – Culver City, CA) Sparks and Shadows, a new boutique record label founded by composer Bear McCreary, announces the release of the Da Vinci’s Demons Original Television Soundtrack. The album, containing 26 tracks, over 90 minutes of original music from the first season of the hit Starz Original series produced with Adjacent Productions, will be available through all digital providers on May 28th. A 2-CD collector’s edition will be released later this year. McCreary’s sweeping orchestral score was meticulously researched to accurately represent the time period, without being bound to it. His score combines full orchestra, Renaissance instrumentation, choir and ethnic soloists with the renowned Calder Quartet and surging contemporary synthesis. McCreary continues to write for the television show The Walking Dead. Recently he lent his talents to SyFy and Trion World’s groundbreaking entertainment experience, Defiance, a combined launch of a MMO videogame. His upcoming film projects include Europa Report, which will premiere at the Los Angeles Film Festival in June, and Knights of Badassdom. His other credits include critically acclaimed scores for series such as Terminator: The Sarah Connor Chronicles, Eureka and The Cape. His swashbuckling score for Human Target featured the largest orchestra ever assembled in the history of series television and earned him his first Emmy nomination. His videogame credits include SOCOM 4 and Dark Void. 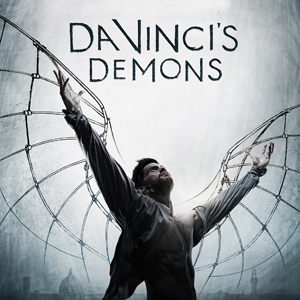 Writer / director David S. Goyer’s historical adventure series Da Vinci’s Demons, premiered on STARZ on April 12th, and was renewed by the network for a second season the very next day. The secret history of Leonardo Da Vinci's tantalizing life reveals a portrait of a young man tortured by a gift of superhuman genius. He finds himself in a conflict between truth and lies, religion and reason, past and future. His aspirations are used against him by the opposing forces of the time—luring him into a game of seduction where those who despise his intellect need him most. STARZ presents Da Vinci’s Demons, airing on Friday nights. The first season finale will premiere on Friday, June 7, 2013. Da Vinci’s Demons – Original Television Soundtrack, composed by Bear McCreary will be available through all major digital providers on May 28th. Other upcoming releases from Sparks & Shadows include McCreary's soundtracks for the multimedia science fiction epic Defiance, both for the television series (SyFy) and the MMO shooter game (Trion Worlds). This summer, the label will also release McCreary's score for the feature film Europa Report (Magnet), a science fiction thriller that explores the first manned mission to Jupiter’s mysterious moon, Europa. I adore the show with it's gorgeous imagery and entertaining history lessons, if a bit askew. I will have to pay more attention to the score while watching tonight.